Featured Pet Stimpie has a huge heart yearning for just the right person. Photo courtesy: The Humane Society for Tacoma and Pierce County. Submitted by The Humane Society for Tacoma and Pierce County. Smoochable Featured Pet Stimpie has a huge heart yearning for just the right person(s) to envelope her in his/her arms. 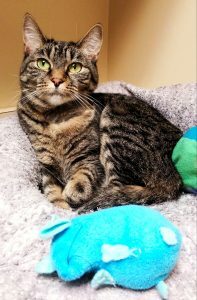 The petite brown tabby is five-years-young and has the sweetest little meow and the tiniest button nose you’ve ever seen. She’ll converse with you, and make deep soulful eye contact as she’s opening up. So lend an ear every so often, and she’ll be so very content you listened.